The Petrofac Training Cup will not be the cornerstone of either Rangers or St Mirren's season, but their encounter in the semi-final on Saturday still holds significance. The circumstances that carry both sides into the game bring an additional edge to the outcome, even if a final is at stake when they meet at Ibrox. Defeat, after all, would not be brushed aside as insignificant. Rangers will be expected to progress, playing at home and having lost only one league game all season. They have also recorded two victories against the Paisley side already in this campaign. Mark Warburton has bristled at times, though. He felt the reaction to his side's defeat to St Johnstone in the Scottish League Cup was overstated and has spoken of his surprise at his team's form being described as a "crisis" following a draw and a defeat in their last three games. He may be trying to generate a siege mentality among his players, but perspectives at Rangers tend to skew with every result. His side won their first 11 games of the campaign and went on a run of 12 successive victories in the league to establish a significant lead at the top of the Championship. Yet they have since lost to Hibernian and drawn with Livingston, while the Easter Road side have embarked on a run of their own to draw level at the top, albeit Rangers have one game in hand. The sense, then, is of the team's form having run aground, although the greater influence has been the string of victories (now sitting at eight) that Hibs have put together in the league. Rangers' form has been consistent and, mostly, bullish. There is a predictable style of play, but the team has generally had enough quality to overcome opponents even if they're set up to deny them. More points will inevitably be dropped along the campaign, but the measure of Rangers' season will be how they live up to the demand that they win the title this season. 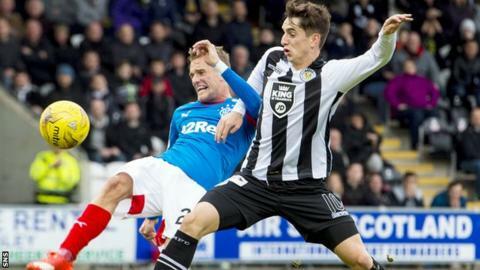 Pressure is a defining quality at Ibrox, since supporters believe that every opponent should be overcome. That level of expectation can stifle players or motivate them and Warburton has tended to recruit well in his first campaign as manager. The team remains a work in progress and if they are to succeed this season then every area of the side will need strengthened for a return to the top-flight. Even so, the likes of James Tavernier, Rob Kiernan, Andy Halliday, Jason Holt and Martyn Waghorn have contributed to the side's progress in their first seasons at the club. There is promise, too, in the players on loan from Premier League sides in England, most notably midfielder Gideon Zelalem. Victory or defeat by St Mirren will become incidental to the bigger picture of this campaign, but either will feel immediately significant, particularly a defeat. The visitors travel to Ibrox in a state of anxiety. There is little other response to an underwhelming campaign that has seen them cut adrift with Livingston and Dumbarton, nine points adrift of Queen of the South in sixth place. Frustration has, at times, grown to anger. A late goal rescued a draw against Raith Rovers in midweek, but the away support could not suppress their disillusionment with the performance and Ian Murray reacted with criticism towards the fans. That kind of hot-headedness betrays the extent of the pressure the St Mirren manager is facing. He has only won two league games all season and they were knocked out of the League Cup by Livingston. The recent appointment of Alex Miller as assistant manager was an attempt to regroup and he might yet bring some perspective and experience to bear. St Mirren have a squad that ought to be performing better, but confidence has drained from the side. The result has been a team that is gripped by its lack of self-esteem. A win at Ibrox would provide the kind of jolt that might change their mood and there are players like Andy Webster, Stephen Thompson and Jamie Langfield who will not be fazed by visiting Ibrox. There should be vitality in the youth of the likes of Callum Gallagher, Stephen Mallan and Lawrence Shankland, but they have seemed overwhelmed at times - even if Mallan has been intermittently impressive. The odds are stacked against St Mirren, although that can sometimes have a liberating effect. Rangers should be sound enough to prevail, but there is intrigue in the tie nonetheless.